Sixteen HIPAA Forms and Resources for Business Associates. All New and Fully Updated for the HIPAA Final Rule. This collection of essential HIPAA forms and resources is fully editable and ready to be customized for your specific needs. These forms and resources are designed specifically for Business Associates, and will save you many hours and dollars of development time versus creating them from scratch. This product also includes our exclusive HIPAA Omnibus Final Rule Summary, which details all the key changes that the Final Rule made to the HIPAA Regulations. Be sure your HIPAA forms are all up-to-date with the "Omnibus" Final Rule with this collection. Most forms and resources in this collection require some editing before use. HIPAA Authorization Form for Release of Records (Model) Template -- This version of the HIPAA Authorization Form is the "Model" version that shows what data goes in which fields for the patient and the Business Associate. 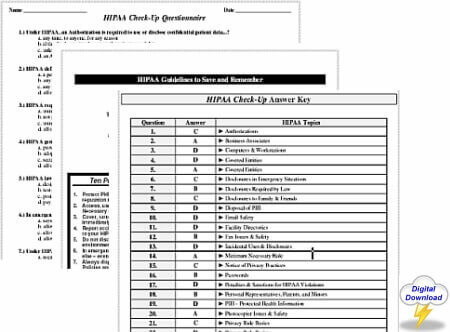 HIPAA Authorization Form for Release of Records (Ready) Template -- This version of the HIPAA Authorization Form is the ready-to-use version (after editing), and is identical to the "Model" version, but without instructions. Disclosure Accounting Log Template -- A log sheet to record the HIPAA-required data for certain PHI disclosures that must be recorded and reported to patients upon request. Privacy Complaint Form Template -- A model HIPAA Privacy Complaint form used for accepting complaints from patients and consumers. Easily edited to suit your needs. Request Form Template: Alternate Communication of PHI -- This form is used by patients and consumers to request an alternate means or method of communicating their Protected Health Information (PHI) to them. Request Form Template: Amend PHI -- This form is used by patients and consumers to request that an amendment be added to their health records. Request Form Template: Disclosure Accounting -- This form is used by patients and consumers to request an accounting of certain disclosures of their Protected Health Information (PHI). Request Form Template: Restrict PHI Uses & Disclosures -- This form is used by patients and consumers to request restrictions on the use and disclosure of their Protected Health Information (PHI). Request Form Template: View or Copy PHI -- This form is used by patients and consumers to request a copy of their Protected Health Information (PHI). HIPAA Omnibus Final Rule Summary -- Twenty-five (25) pages in length, this Summary contains all the important changes to the HIPAA Regulations enacted in the HIPAA Final Rule. HIPAA Authorization Compliance Checklist -- This handy checklist details every element of a valid Authorization required by the HIPAA regulations. Business Associate Agreement Template -- This BA Agreement template contains all the terms and conditions required by the HIPAA Final Rule, plus several additional terms recommended by our experts (clearly marked), that can be edited out or left in. Privacy Officer Recommended Duties -- This handy document lists the recommended duties of the HIPAA Privacy Officer. Suitable for Business Associates of all sizes and types. Privacy-Security Walk-through -- This valuable resource allows you to conduct your own informal assessment of your data privacy and security. Find weaknesses and vulnerabilities before they create HIPAA violations. Customize the templates and forms in this product for your own unique needs and save thousands on attorney fees. All items included in this collection are fully HIPAA compliant with the Final Rule and are in Microsoft Word format for easy editing and customization.